In recent times Cardiff Dragons FC has expanded significantly, now playing in several leagues, but playing in the Gay Football Supporters’ Network (GFSN) League is where it all began for us, and we’re very proud to be a part of it. 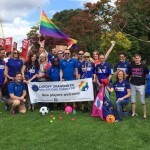 The Gay Football Supporters’ Network (GFSN) is a voluntary organisation, and was established in 1989 as a social network for LGB&T football fans across the UK. Since then it expanded into hosting its own national league and takes the lead in tackling homophobia, biphobia, and transphobia in football. Since their formation in 1989, their main concerns still hold true today – that is while football is the greatest sport in the world, it can be intimidating for LGB&T persons due to the phobic attitudes within all aspects of the game. The GFSN League is unique – its the world’s only national LGB&T football league and spans the length and breadth of the UK. But the GFSN League is not just a football league – it’s much more than that. Together with the Gay Football Supporters Network, it serves as a social network for football players, managers, and fans alike. With a mixed gender policy and rolling substitutes, the league is proud to have a diverse range of players who embrace the social and friendly aspect of the league. Visit the GFSN website for more information. The Gay Football Supporters Network (GFSN) was founded in early 1989 by a small but dedicated group of Football Supporters who happened to be gay. This dedicated band went out to spread the word to the world that being queer did not mean an exclusive dislike of their favourite sport. From those small beginnings meeting as a group in the Salmon & Compasses in Chapel Market, North London, the national organisation began to grow. The GFSN worked to establish a social network for gay football supporters, to encourage the formation of gay teams for players of all abilities, and to campaign against homophobia in football, with a view to creating a safe and tolerant environment and to gain the respect and recognition for gay involvement in football.